She should be one happy teen! And the envy of her friends. It’s a perfect teenager’s room, congrats! Kate, it’s awesome! 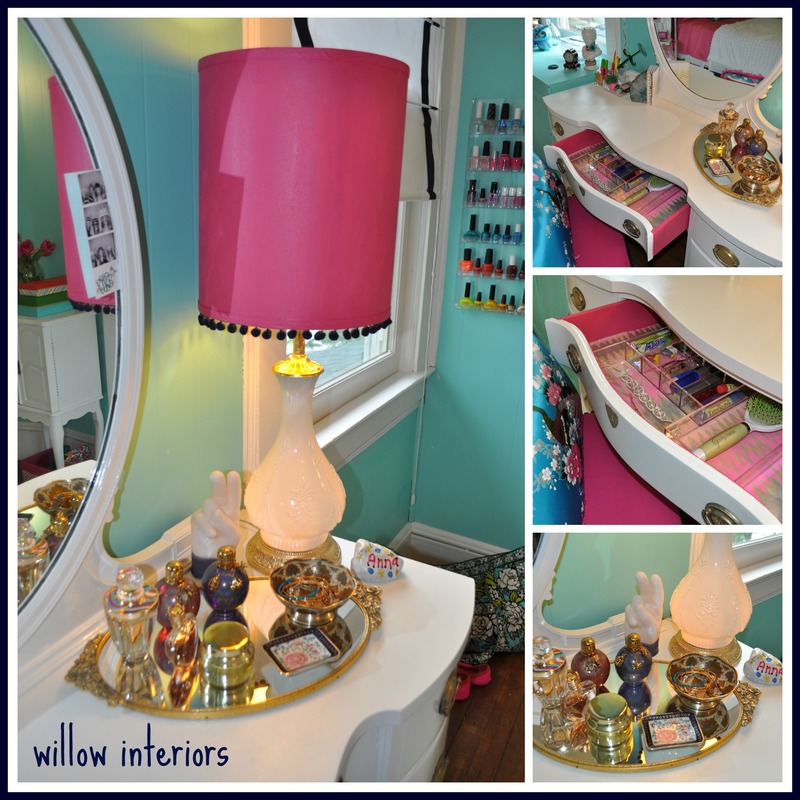 I’m totally loving your canopy (and have to show a pic of it to my daughter who decided to scrap the idea for her room), the refinished vanity, and all of the fun, bright accessories! I can only imagine how thrilled your daughter is!! It is looking so lovely! I love the canopy. It’s quite stunning. 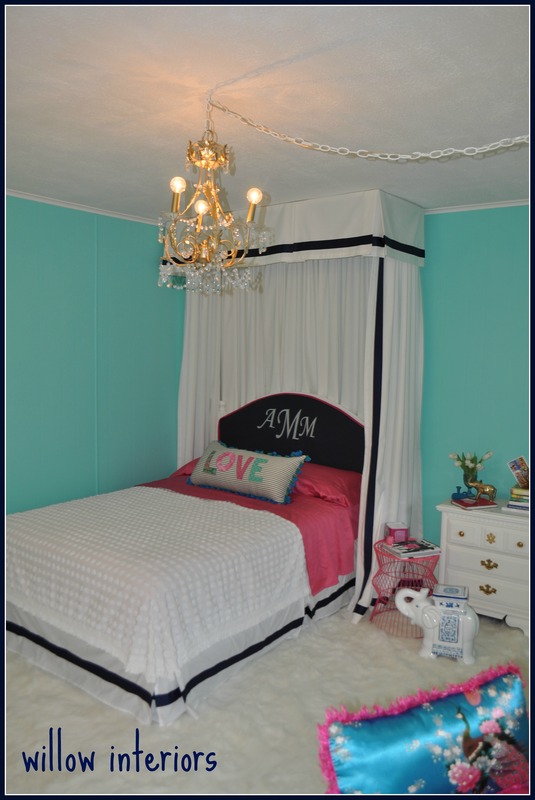 I am in love with the colors…and the shades…and the monogrammed headboard…it all looks great! 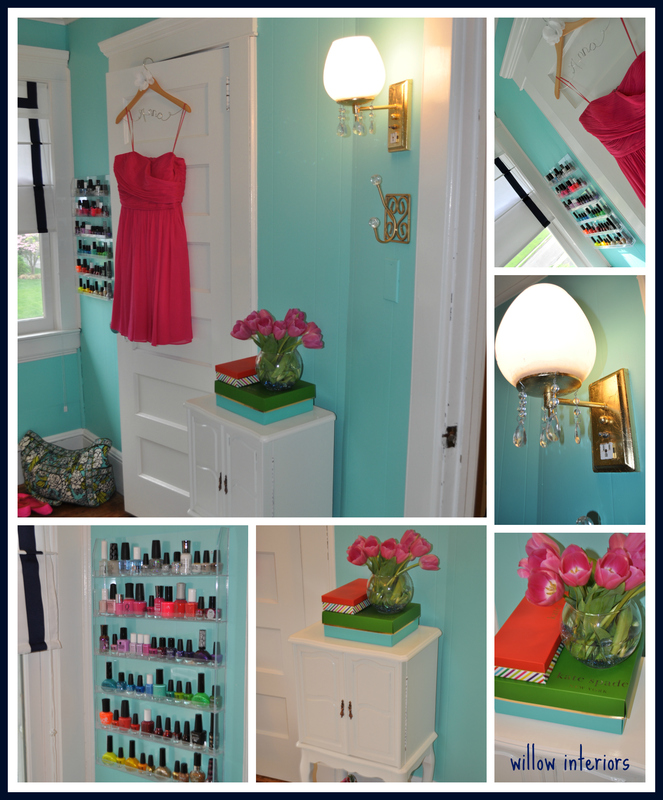 Such fun colors and lucky girl to have the perfect vanity and nail polish on display. Great job. 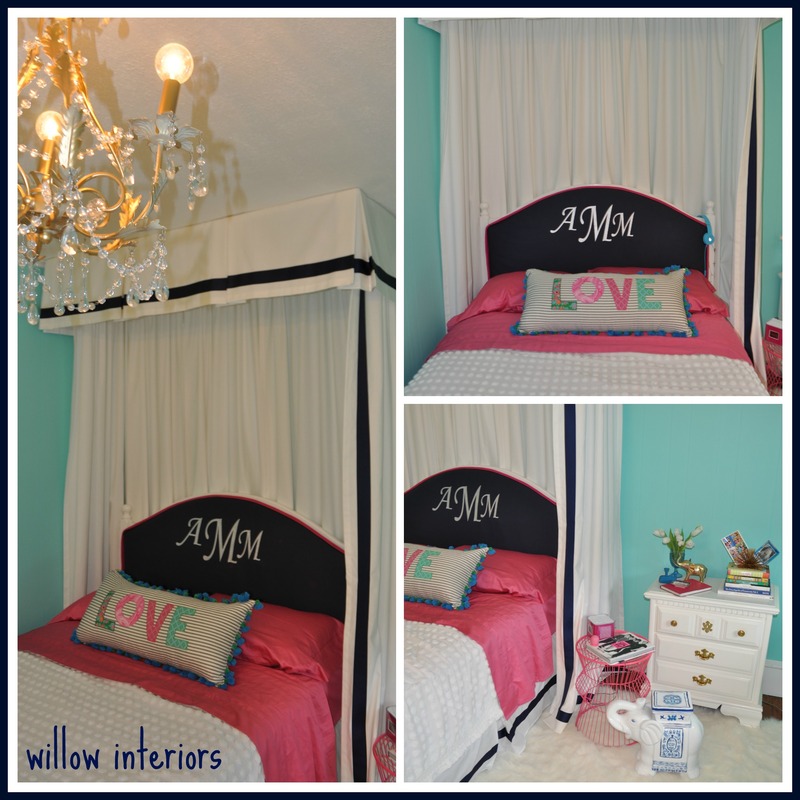 I love the bold canopy and bedskirt! And it solves a problem, too. Clever. That chenille was a great find. Kudos to you! Lovely room. 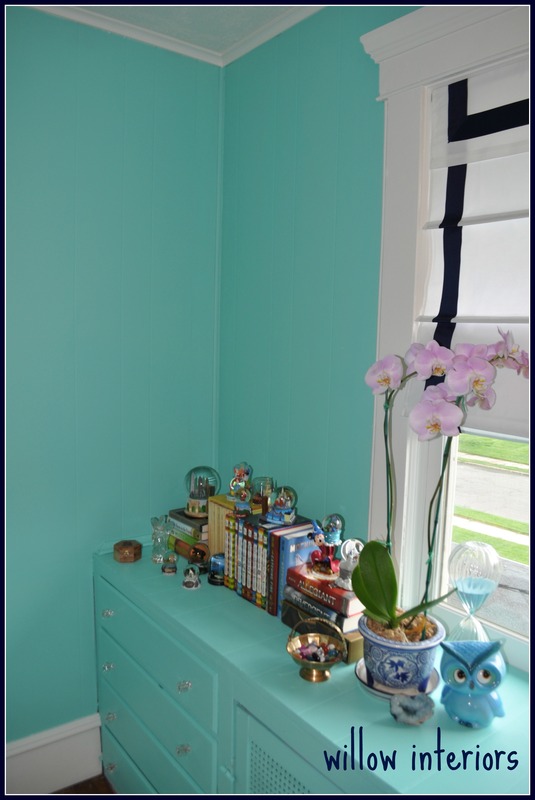 Of course there is nothing I like better than a gorgeous turquoise room! 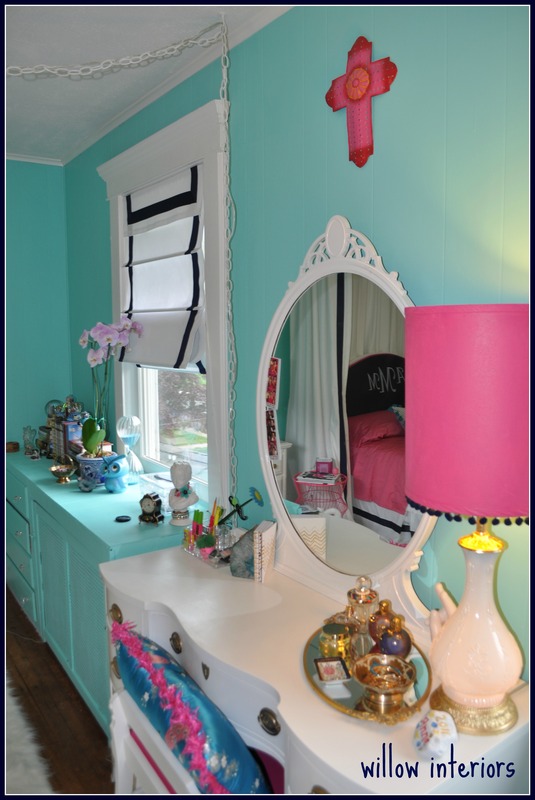 Great job on this beautiful bedroom! looks so so good girl!!! I love, love, love the aqua and the black and white! The lighting is great and I think my favorite part is the polish wall “art”!!! Great job! Hi Kate! You did a great job, and I love the color you put on the wall. It’s fun, fresh, and definitely teen inspired. Your last photo is so funny, looks like you don’t have a choice for your next room. Great job. Kate I just love the grosgrain ribbon you added to the curtains and bedskirt! It really made it pop! 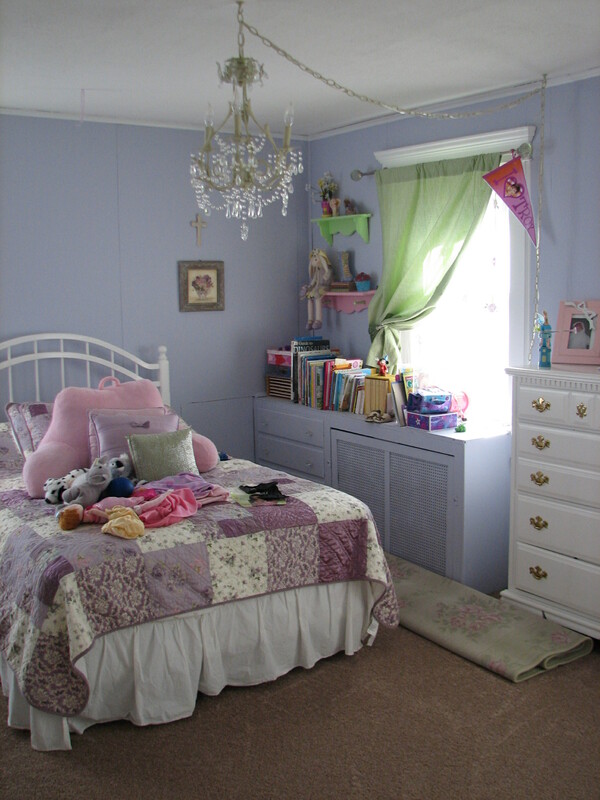 This room is fit for a princess! So pretty great job! Kate, I love what you did! The bedddddd!!! WHAT?!!! That is so awesome! The canopy is dreamy and I adore the grosgrain ribbon detail on that and the bedskirt. 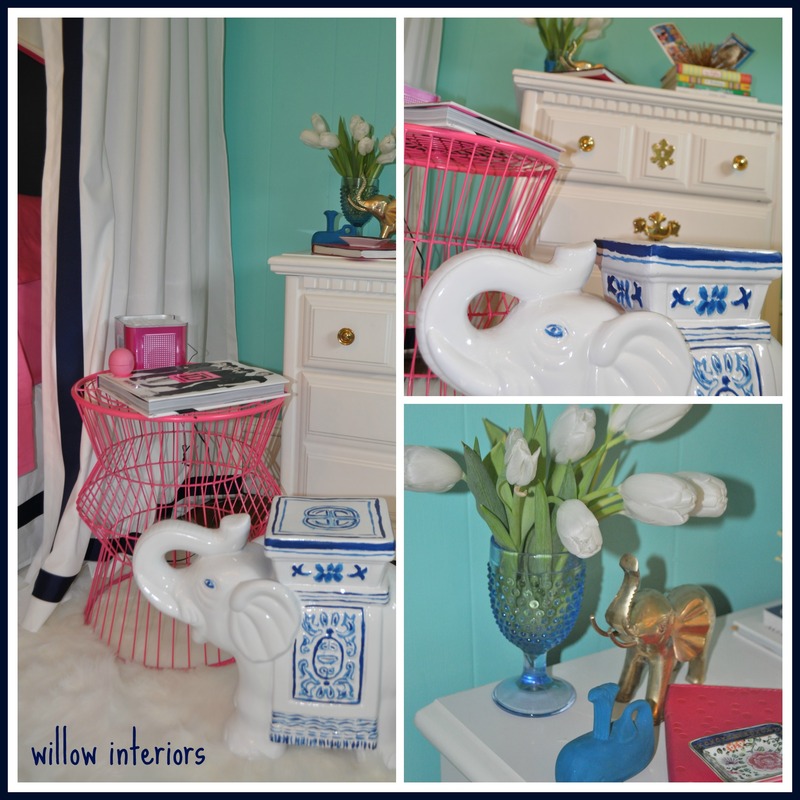 Also the wall color, the monogrammed headboard, the elephant, and that cool nailpolish rack – I need one of those for my daughter! 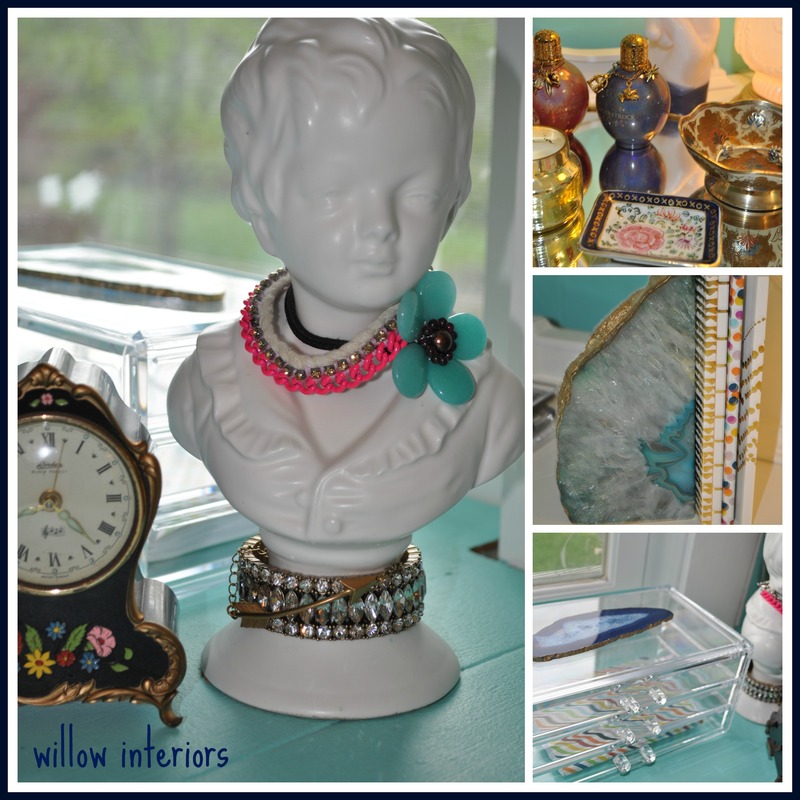 I tried to repurpose a spice rack but let’s just say, it was a DIY fail. Thanks for sharing all your great ideas, I love how the room came out and hope Anna does too!! 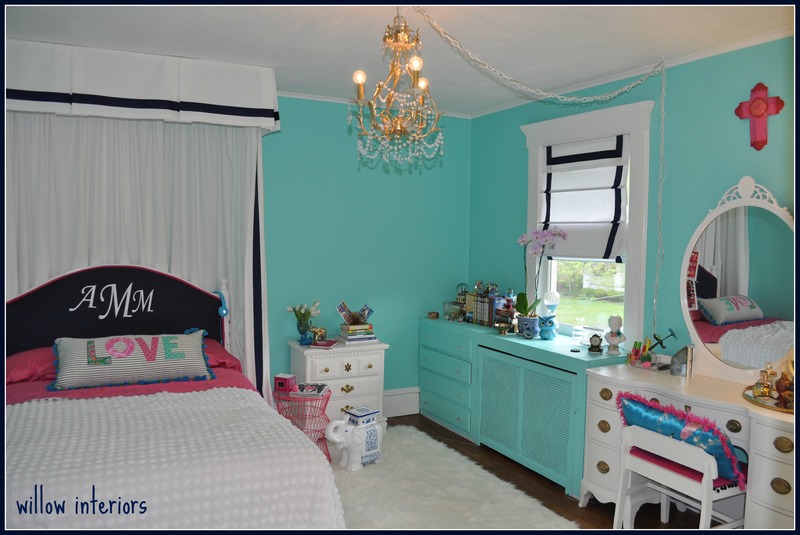 Kate — what a fantastic bedroom you’ve created for your daughter!! 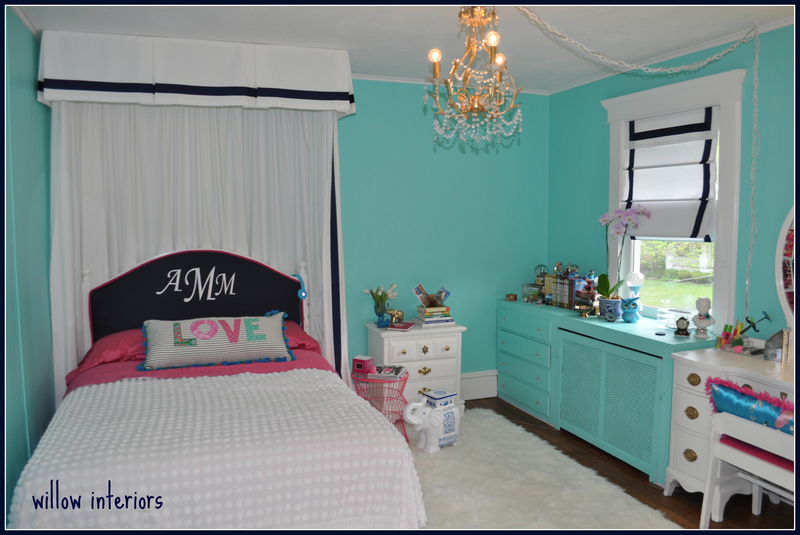 The beautiful, fun paint color, while perfect for a teen bedroom, wasn’t easy to balance, I’m sure, but you did it! All of that white made it work perfectly!! There are so many well thought out details you’ve incorporated here. My daughter would be VERY jealous of that nail polish collection and display. I would have come by earlier, but I’ve been in and out of town plus end of the year school activities. I’m so happy to get to see this gorgeous bedroom — job well done!! Oh wao! What a transformation. I really love your color palette. Loving the bed and shades especially. Lucky girl! Wow! I would have loved to have this room when I was a teenager! I love the shades and the canopy! I want those in my own bedroom!